It is my great pleasure to be here today for the opening ceremony of the Hospital Authority Convention. My thanks to the Hospital Authority for once again organising this international gathering, a signature event for the healthcare sector since 1993. A very warm welcome to those of you coming from abroad to take part in this year's Convention. As you may know, I'm usually called upon to talk about the financial health of Hong Kong. As Financial Secretary, while I am committed to safeguarding Hong Kong's financial stability and fiscal health, I am equally devoted to further enhancing the health of Hong Kong people and ensuring that our healthcare system is sustainable in the long term. Health is one of our key policy areas and has been a major outlay of government expenditure. In my Budget delivered about two months ago, I have proposed to further increase the allocation for healthcare this year by 13.3 per cent to HK$71.2 billion, bringing the share of healthcare expenditure up to 17.5 per cent of our total recurrent expenditure. Long-term planning is essential in sustaining the quality of our health services. 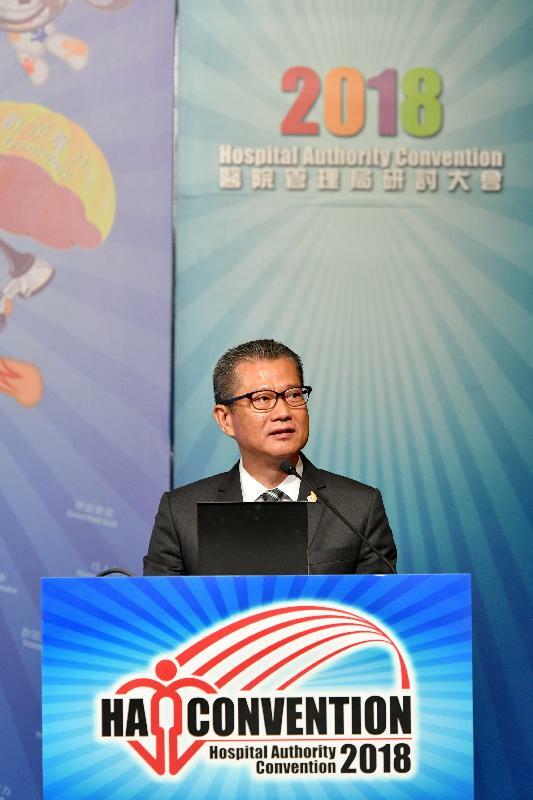 The Hospital Authority and the Government are pressing ahead with the HK$200 billion 10-year hospital development plan. I have further earmarked another HK$300 billion in this year's Budget for implementing the second 10-year hospital development plan, and improving clinic facilities and healthcare teaching facilities. And to ensure the rising medical needs of our community continue to be met, we will also further increase the number of publicly funded training places for doctors, dentists, nurses and relevant allied healthcare professionals. Hong Kong, like many other advanced economies in the world, is facing the daunting challenges of an ageing population, the prevalence of chronic diseases and increasingly drug-resistant communicable diseases. Primary healthcare, which focuses on health promotion, disease prevention and chronic care, will be central in tackling these challenges. The Government is currently reviewing the service with a view to drawing up a blueprint for the sustainable development of primary healthcare services in Hong Kong. Therefore, this year's Convention, with primary healthcare and chronic diseases management as its key topic, is a fitting opportunity for the local and overseas experts and practitioners to share their experiences and insights, and to promote the best practices in primary healthcare. I am sure all of you will have a rewarding and fruitful experience participating in the plenary sessions, masterclasses and symposiums during the two-day Convention. Allow me to thank the Hospital Authority again for organising this year's Convention and for its invaluable role in safeguarding the health of our community and improving the quality of life of our people.